Mundaneum à l'Internet is a stamp by François Schuiten. 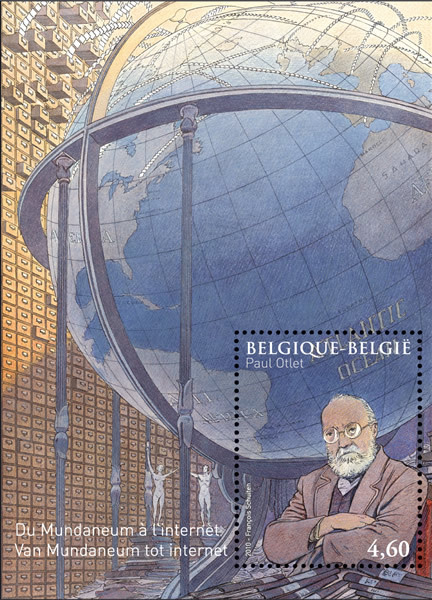 Paul Otlet, architect of the Internet avant la lettre, and a Belgian bibliographer, theosophist, pacifist and entrepreneur. From childhood he hoped to catch all human knowledge in a bibliographic system. Together with Henri La Fontaine he created in 1910 the Mundaneum, an utopian “city of the mind” for their mega catalog of hundreds of thousands of fiche cards. After his death becomes the Mundaneum was forgotten until a group of volunteers revives the establishment of the special Mundaneum museum in Bergen in the early 90s. One of the enthusiastic contributors to this massive restoration project was François Schuiten, renowned Belgian comic artist and designer of the special issue “From the Mundaneum to the Internet” stamp. The stamp was issued January 16, 2010.